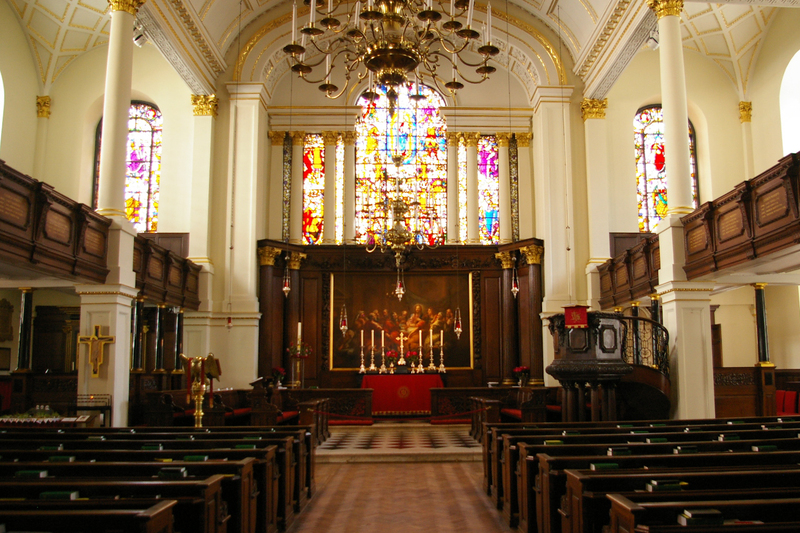 The Parish Church of St George, Hanover Square is where John Keats’ parents married in 1794. 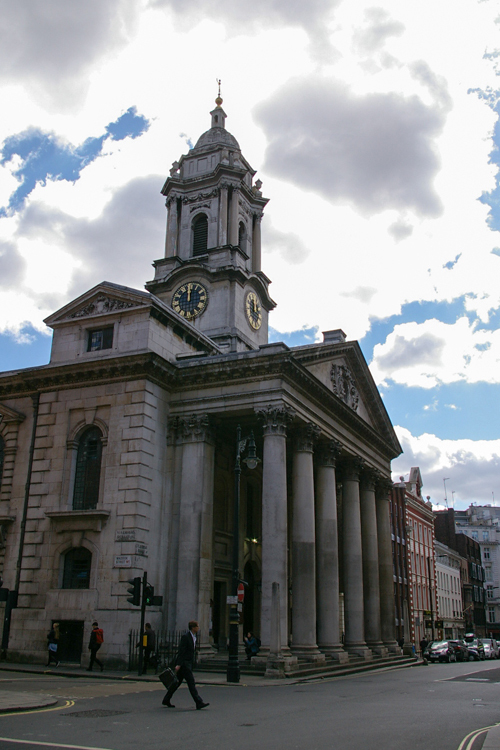 The church was designed by John James (one of Christopher Wren’s assistants), and built in 1721-25, funded by Queen Anne’s “Commission for Building Fifty New Churches”. This fashionable church in Mayfair has always been a favoured venue for ‘high society’ weddings. Thomas Keats and Frances Jennings were more lower-middle class, but they married there on 9 October 1794. The church is a fair distance from their own parish, and so the choice can be seen as a statement of their ‘social intentions’ (as Andrew Motion puts it). Thomas died in 1804, and Frances married William Rawlings just over two months later on 27 June 1804. I honestly don’t mean to judge her, but it does seem incredibly tactless that Frances chose, once more, to marry at St George’s. Other weddings at the church include that of Theodore Roosevelt (future US President) and Edith Carow in 1886 – and it is noticeable that Wikipedia lists a number of architects marrying there, too. The church’s burial grounds were located separately at Mount Street and, later, at Bayswater. Burials include Laurence Sterne (author of Tristram Shandy) in 1768 and Ann Radcliffe (author of Gothic novels) in 1823. Handel (1685-1759) was a regular worshipper at the church, and it is still used as a musical venue by the annual London Handel Festival. St George’s Hanover Square seems still very active today, in this busy part of the city, only a few minutes’ walk from Oxford Street. I like that the official website includes a photo of people eating their sandwiches while sitting in the sunshine on the steps of the portico – it makes the place seem very much a part of London life. The website states that the church was ‘splendidly refurbished’ in 2010, though it seems that this was sympathetically done and perhaps Keats’ parents wouldn’t find it unfamiliar. The painting of the Last Supper behind the altar was painted for the church by William Kent in 1724, so they would have known that. The church is a lovely place, and worth a visit. It is easily found, if you look south from Hanover Square, with the Corinthian columns of the facade standing well forward of the other buildings. Hanover Square itself is quite small, and is surrounded by traffic and buildings, but seems a lovely green space. It features a statue of William Pitt the Younger (1759-1806). 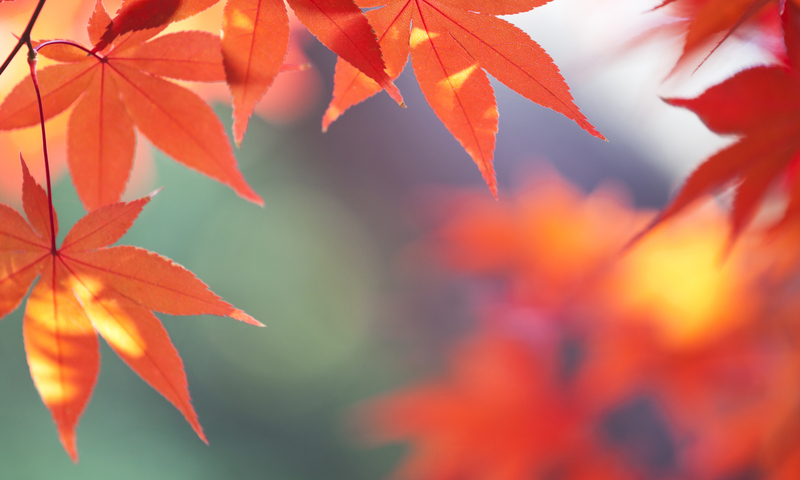 Opening hours: Open Monday to Friday until 4pm, with slightly later hours on Wednesdays. Open on Sunday mornings. Closed on Saturdays other than for weddings and special services. Check the official site for details of hours, music and services!